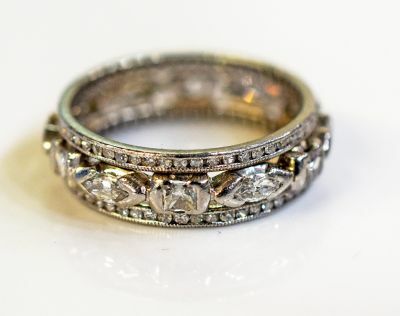 A beautiful Art Deco combinaton of three platinum eternity bands, circa 1930, featuring a total of 108 single cut diamonds, est. 0.49ct (VS-SI clarity & G-H colour) on the two outer bands; with the centre band containing 6 marquise faceted diamonds, est. 0.45ct (SI1-SI2 clarity & G-H colour) and 6 modified French cut diamonds, est. 0.29ct (VS-SI clarity & G-H colour). The outer bands are finely mill grained. It is size 5.